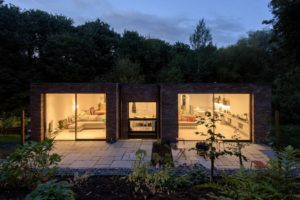 Two new bespoke houses built by Northern Bear Building Services were featured on Grand Designs on Channel 4 on 7 November 2018. 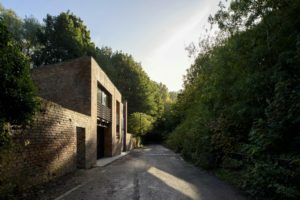 The development at Ouseburn Road, Newcastle upon Tyne, was in the running for the RIBA House of the Year award. This innovative construction had already won the RIBA North East Award. The reason behind the new development is unusual. Two households in Ouseburn Road, who had been neighbours for 24 years, wished to downsize but wanted to continue being neighbours. They commissioned Miller Partnership Architects of Newcastle upon Tyne to design two purpose-build semi-detached houses at the bottom of their very long gardens. The new houses were designed to sit comfortably side by side. They share the same building lines and use a similar palette of materials and a similar architectural language, shared also with the existing property in Ouseburn Road. Fully planted roofs maintain the green outlook over the valley when viewed from the Victorian terrace above. Despite the tightly constrained sites, the new houses utilise all available space to create open plan family living over two floors. Extensive glazing and carefully placed roof lights maximise the connection to light and the beautiful leafy context. The new properties benefit from underground heat pump installations where the flow and return pipework has been installed over 100m into the ground below the properties to gain heat from the underground strata. The ground floor of each property has been built into the existing bankside and a retaining wall has been constructed using a specialised waterproof concrete system to retain the existing sloping bankside. Extensive grouting of the existing mine workings was required under each property and the raft slab was constructed on piles to ensure loads were transferred down to the existing rock level.